The Citi /AAdvantage Platinum Select MasterCard and the CitiBusiness / AAdvantage Platinum Select World MasterCard bonus are now each offering 30,000 American Airlines for spending $1,000 the card within three months of account opening. Historically that is not a very high sign up bonus for either. Periodically Citi will raise the bonuses to 50k AAdvantage miles for spending $3,000 in three months, and not that long ago the public bonuses were 60,000 miles for each of the personal and business cards. If you missed out on the public offers, there’s no need to fret. 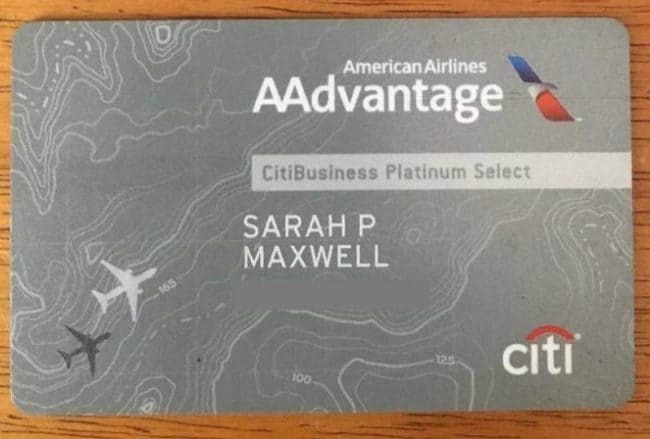 Doctor of Credit published a link to apply for the CitiBusiness / AAdvantage card with a 60k bonus for spending $3,000 in three months located by a reader. As of today, 8/17/17, the link is still live. We do get commissions when you sign up for some cards, but not this one. We just want you to be aware of the best deals. If you signed up for lower sign up offer within the last 90 days, Citi has a pretty good track record of matching sign up bonuses to what’s currently available. Call the number on the back of your card or send a secure message through your online account–the sooner the better. Apparently if you call Citi it’s possible to get matched to an even higher 75k bonus offer for the personal and business Citi AAdvantage cards. Looks like there are more data points for being matched to a 75k offer on the business card than the personal card. People are reporting matches for simply letting the representative know that they saw an offer for a 75,000 mile bonus and asking nicely to be matched to it. If you haven’t opened or closed a CitiBusiness / AAdvantage Platinum Select World MasterCard in the last 24 months, then now’s the time to apply for it as the bonus hasn’t ever been any higher than 60,000 miles. After applying try calling in and asking to be matched to 75,000 mile offer you saw online for kicks–you might just get an extra 15,000 miles. Good u put the LINK in the post which blue is nice but 2x it . Very costly PAST mistake by Scott by only putting link @ top of website where it should be too and keep it to the current offer !!! Good card got it @60K targeted 6 months ago . How does Citi treat their citibusiness card for two legitimate businesses. I havent had this card in over 24 months…so Im good there. But will citi allow two seperate applications simultaneously with two real EIN’s and approve both apps for two cards? Any data points there? Also, on the personal card at 30k, I know YMWV, but if you havent gotten this card in say 24 months also…what confidence would you apply for the 30k in hopes a match offer phone call could happen? I know that citibusiness had a 75k match offer in the recent past, but was there one also for the personal citi AA card? Regarding your first question, it’s hard to be sure, but from data points I’ve seen you probably can earn another sign up bonus for the same business card as long as you use a different EIN (which you said you had, so that shouldn’t be a problem). You shouldn’t apply for both on the same day however as the rule of thumb is that you can be approved for no more than one Citi card in an eight day period. If you want two Citi cards of any kind, get them on days 1 and 9. Regarding your second question, personally I probably wouldn’t expect a 60k match on the 30k offer right now as even the link for the 60k offer on the personal card that was floating around after the public 60k bonus died is not working anymore. However, I could be wrong and too conservative in that thinking because yes, some people have been matched to the 75k offer on the personal card (just not as many as have reported being matched to 75k with the business card). Just wanted to personally say “thanks” for reaching out about my question. I totally understand everything you wrote. So I’ll give it a little thought this weekend. Appreciate what you do. Hope you have a fun weekend planned…where ever this finds ya!!! You’re eligible for the bonus if you’ve only opened a personal Citi AA Platinum Select Card in the past 24 month, but never had the CitiBusiness Plat Select, yes? I HAD both a few years ago so I called and asked can u look into my card history. Can I get the points was yes.. If you had the cards a few years ago, then it’s probably been 24 months since you closed them, which is why you’re eligible for both. Thx for responding but my question is regarding being eligible for the CitiBusiness bonus even if you’ve opened/closed the personal AA plat select less than 24 months ago. Correct. For the purpose of Citi’s sign up bonus rule, even within the same co-brand/family (like AAdvantage co-branded cards, for example) Business cards are considered separate. Opening or closing the personal Citi / AAdvantage Platinum does not affect your eligibility for the bonus on the CitiBusiness / AAdvantage card. It does, however, affect your eligibility for the Citi / AAdvantage Executive card (and opening or closing a Citi / AAdvantage Executive card would affect your eligibility for the bonus on the personal Citi / AAdvantage Platinum card). Just got approved instantly for 60k card. Waiting for it to arrive so i can call and ask for 75k match. fingers crossed. That was Yes Before as with me CALL then u will Know . Hi, Thanks. Got approved for the 60K offer and then matched to the 75K offer. They just agreed to 15K more points. One question I had was what encompasses the “Telecommunications category” on spend that will earn 2X. Is it Office Supply stores like staples, office max/depot in addition to Dish network, ATT, Directv, Comcast etc? Just wondering if anyone knows what is included in that category.